College football is full of traditions on campuses across the country. No matter the size or level of play, there are certain customs on every campus that make them unique and special to the fans, student body, athletes and coaches. The University of Tennessee at Chattanooga is no different when it comes to gameday lore. UTC begins football Saturdays with the Moc Walk through the tailgaters in the First Tennessee Pavilion as the team enters Finley Stadium. It ends with the postgame singing of the alma mater with the Marching Mocs. Sam Herder from HeroSports.com did an article on the Best Traditions in the FCS this week. He put the Mocs postgame singing with the band at No. 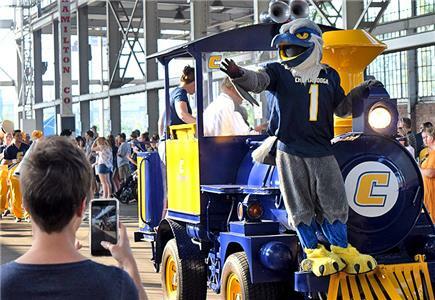 "College football is unique in that there are so many special traditions and game day rituals that mean so much to the teams, fans and alumni," stated UTC head coach Tom Arth. "We are very proud of our school and all that our alumni have accomplished. Singing the Alma Mater after every game reminds us all that we are a part of something so special and so much bigger than ourselves. It is an honor for our coaches, players, and staff to have the opportunity to represent Chattanooga every time we take the field."